How to have fun in the Caribbean! Born in the Dominican Republic, 19-year-old Englishman Guy returns to the island frequently after years away in school in England. With his new drone, Guy re-discovered the tropical country he loves, and the video he made, well worth a view. Sosua beach, Sea Horse Ranch, Cabarete and the “Blue Lagoon” in Cabrera. Check it out here. The Dominican Republic is a big country, touched on nearly every side by the waters of the Atlantic Ocean and the Caribbean Sea. Smart Own Boats would be a perfect match. Beautiful and diverse, the Dominican Republic has become the leading Caribbean tourism destination, with most resorts, hotels and rental apartments and houses located on or near the sea. It stands to reason, therefore, that water-related activities are high on the lists of residents and visitors alike. Opportunities exist everywhere in the country for waterborne pursuits, and Smart Own, an established broker based in Dubai, offers a wide range of well-built, versatile craft for both commercial and private use. These are sturdy, good-looking power boats, available in many configurations. For the passenger trade, Smart Own builds a variety of vessels, ranging in length from 32 to 75 feet. 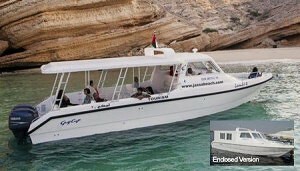 They may be configured for ferry service, operating on a regular schedule, or as passenger-carrying tour boats employed in various tourism locations as excursion vessels. 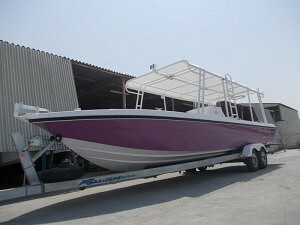 In addition, sportfishing, scuba and VIP versions are available. 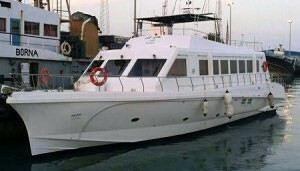 The 75-foot ferry seats 100 passengers in economy and first class air conditioned cabins and makes 20 knots maximum speed. Twin inboard diesel engines and a very large fuel capacity ensure long range and reliability while providing comfortable seating. A small forward cabin has bunks and simple facilities for 4 crew. At the other end of the Smart Own line is the 32-foot scuba excursion boat. This efficient, outboard-powered vessel carries 10 people including the driver and has racks for 16 scuba tanks. With fuel capacity that ensures sufficient range, and with twin engines for reliability, this fiberglass beauty will reach the best dive sites in safety and comfort. In between the smaller scuba boat and the large ferry are many offerings in 36, 40 and 56-foot lengths. These hulls may be configured in many ways, as ferries, tour boats, fishing vessels or VIP craft suitable for executive meetings or luxury transportation. All are built to superior standards and feature twin engines, generous fuel capacity and top-notch marine-grade hardware. Versatility is the watchword for Smart Own boats of all types. The Smart Own client may customize his vessel to fit any number of uses, and the builder will accommodate almost any boating need. If you are interested in acquiring such a boat, get in touch and we’ll give you more information about this superior line of watercraft.